Before you purchase your next sponge mop, make sure you take a look at this list! A lightweight sponge mop is key for those who are looking for simething easy to use for mopping all your floors. Many of these sponge mops come with fantastic features like a replaceable mop head or self-wringing mechanism. There's a lot of easy-cleaning in a mop, which is why they're such a popular tool. Whether you have wood, clean tiles or linoleum floors, a sponge mop is a great option. They're ideal for getting into difficult corners, mopping edges and getting a great all-around clean. To help you with finding the perfect mop, check out this list of well-reviewed, popular sponge mops! The rating can give you a good idea of what others who have tried out these mops think about their abilities. In addition, knowing the size and weight is important if you need something that suits your specific needs. Finally, you'll want to consider any special features that might make a mop more suited to your home. When you need something for tackling those stains that tend to be more stubborn, the Superior Performance Mop is a fantastic option. This mop includes a scrubbing brush that you can easily attach for the more serious tasks. The easy-squeeze ability also makes it a handy tool overall. While it might not be the most heavy duty, the Superior mop is ideal for quick cleanups when you just need something that gets the job done. It's also an option that is small enough that it's going to fit easily into many buckets. It certainly helps that it's also a very affordable option! Furthermore, a feature that makes this mop particularly useful is the handle. It's designed to be extra long, so you won't have to bend over it too much, which can result in back pain. With the Superior mop, you won't need to worry about that issue! Using the Superior mop, you'll also be able to prevent small messes from getting any more serious. It's definitely an option that has earned its place as one of the most handy mops out there! 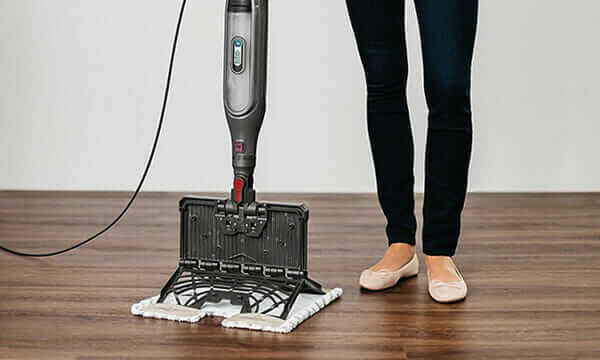 While many enjoy what this mop has to offer, some users can find that the sponge part on the mop can become dislodged from the mop head very easily. This can cause some frustration for customers who want something they can use for a long time as a result. If you're on the hunt for a good mop that can save you a little bit of money, this is well worth trying out! When you need something for floors that are really dirty, the Libman Nitty Gritty Mop is a perfect choice. It's truly a handy tool that offers a decent price and a high-quality product overall. You really can't go wrong when using this mop on your household messes. Furthermore, the Libman mop includes some great features like a controllable roller mechanism, built-in scrub brush and squeezable lever for when you need to wring it out. Due to the design, there are few bits of debris that could possibly stand a chance in the wake of this tool. Due to the lever design, you'll also be able to choose whether to let just a little water out, or much more. In addition, the sponge on this mop works well against a number of different surfaces. The added mechanism also makes it easy to switch between mop heads without adding to the mess. As a result of this easy method, you won't need to worry about getting messy in the process. Many of the customers who have tried out this mop have found that it's a tool they really like using. It handles well, often proves itself to be highly durable and gets the job done. Some have even chosen to purchase more than one! While there are customers who swear by this mop, some can find that the sponge on the end can start breaking off the mop within just a couple months of use. As a result, it's a good idea to keep an eye on the portion and contact customer service if you should notice any problems. If you're looking for something tough enough to get into all the nooks and crannies of your home, this is an ideal choice. For those who are searching for a true mopping workhorse, the Casabella Original is a fantastic option. This mop is Italian-imported and comes with a classic look as well as excellent capability. Consequently, it's also available in two unique colors including blue and painted steel. Furthermore, the Casabella is ideal for those who are looking for deep cleaning and heavy-duty ability. From the pole to the mop head, this mop is also made to be rust-resistant and provide durability rivaling even some of the more expensive options out there. The sponge this mop uses is also designed to be super absorbent in order to deliver the best possible cleaning capabilities. In addition, you'll be able to enjoy the beauty of the Casabella Original for quite a long time, thanks to the built-to-last manufacturing. To prove the sturdiness of this mop, it even includes a lifetime guarantee so that you can feel confident in the quality you're getting. From the pole to the levers, it's made with top-quality steel to provide the most sturdy tool possible. Overall, whether you're just doing a quick pick-up or spending hours on an intense deep clean, you can't go wrong with the Casabella Original. Compared to other types of mops that are sold on the market today, this one is more durable, reliable and efficient. It's absolutely an option worth trying out! While there are many who swear by this mop, some users can find that some breakages can occur in the mop heads or levers that become frustrating. In addition, there can be problems with the sponge not picking up enough water to do a thorough job. If you love a rougher sponge mop and want something highly efficient, the Casabella Original is a perfect choice. The O-Cedar Roller Mop is perfect for homes that have a lot of wood flooring. It's gets your floors clean without spreading around too much water, which is great compared to mops that can become easily filled with it. Consequently, if you need something for the wooden flooring in your home, it's worth checking out. O-Cedar is a name that typically implies quality when it comes to household tools, and this mop is no different. It was designed specifically with hardwood floors in mind so that caring for that type of flooring is easier. As a result, the sponge is made to stay very dry so that excess water doesn't seep into the floor and cause damage. Furthermore, the O-Cedar is made to gently erase dirt that has dried on and other marks alike using the felt pad. As a result, you won't need to worry about scratches or other issues on your wood floors. 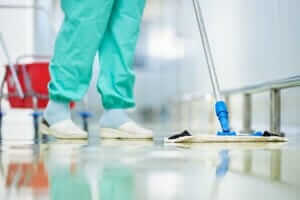 This mop strives to prevent them, ensuring top quality care for your expensive flooring. Overall, this mop is one that is designed very well and many who have used it on their hardwood floors find it to be an excellent tool. It removes debris, spills and more without using too much water or causing damage to the wood. As a result, it's definitely the top choice for those with wood floors. If you are looking another appliances for cleaning hardwood floors, these wood floor vacuums is the best to get the job done. Some users can experience breakages or find that the sponge isn't able to hold in the amount of water they need. There can also be issues with breakages, so make sure to be careful if you decide to try out this mop. If you want a mop that can get wood floors clean without too much excess water, this is a fantastic option. If you don't need something with a scrubber built in, the Rubbermaid Commercial Sponge Mop is capable of going a great job cleaning up your floors. It picks up just about anything and makes the task of mopping a lot easier. Many who have tried this mop out have found that it's an excellent addition to their cleaning tools. Furthermore, it's an option that provides you with sturdy construction, so you won't need to worry about replacing the Rubbermaid too often. Do keep in mind that it's able to hold a great deal of water, so it might not be the perfect option for hardwood floors. However, if you're careful with it then this mop can be used just about anywhere safely. In addition, this option uses a PVA sponge. What that means is that not only can it hang in there for a long time, it's also going to be able to resist harsh chemicals easier than other mops out there. The mop heads you can get as a replacement are also nicely made, so you won't need to purchase a ton to get them to last. Overall, if you're looking for a mop that you can use a lot without worry, the Rubbermaid is a fantastic choice. It's a durable mop that picks up just about everything on your floors, which is especially useful if you have small children or pets. When you want something reliable, check out the Rubbermaid Commercial. There can be some problems with rusting in the mop head and screws, which can cause problems when you need to switch out the head. There can also be instances where the sponge is a little too stuff to do a good job of scrubbing an area. If you're looking for another great option for homes with plenty of hard flooring, this is a perfect way to go. If you love using Magic Erasers, then the Mr. Clean Power Squeeze Mop should be next on your list to try out! This heavy-duty tool uses one of these erasers in a style designed to work as a mop head. As a result, it's a great option for getting up all of the dirt and other debris that can wind up on kitchen and bathroom floors. When compared to the mops created by competitors, the Mr. Clean mop is made to remove dirt and scuffs with 50 percent more power. In addition, it's made to be stronger overall, providing you a lasting solution to all of your floor cleaning needs. There are also many who love what the Magic Eraser mop head is able to provide. Because it's a lightweight option, this mop can also be used on walls as well as your flooring. Whether the surface is smooth or textured, the Magic Eraser is able to clean up a variety of messes, from soil to stains. As a result, there's little worry that this tough cleaning pad won't be able to keep up with just about any mess in your home. Overall, the Mr. Clean mop is built to be reliable, durable and highly efficient due to the help of the Magic Eraser. Consequently, it's a great option for just about anyone regardless of your flooring type or the kinds of messes you deal with. From pet hair to dirt and spills, this is one mop that can handle it all without a problem. There are some customers who tried out this mop due to their love of Magic Erasers, only to find that it just didn't work as well in mop form. Others have also found that they may have trouble moving the mop around due the design of the handle. If you want to make the splurge on something with a bit of added kick, the Mr. Clean mop is a great way to go.